Clay Paky is celebrating its 40th anniversary as a company at this year’s PLASA show (stand: N42-K42), while also launching the Scenius Profile beam shaper, and showcasing the Hepikos washlight, Shar-Bar moving LED bar and the Odeon architectural series. The Scenius Profile (pictured main) is positioned at the top of the Clay Paky moving head range. Its advanced optical unit and the 1,400W Osram discharge lamp provide high light output and CRI. Its framing system consists of four independent overlapping blades, which create shapes of all sizes and proportions by working simultaneously on four different focal planes. The Hepikos is a 700W washlight that combines low power consumption with colour quality. Thanks to its PC front lens (Ø 185mm) and narrow 5° beam angle, the fixture can also produce a sharp, thick beam, which can be used for coloured aerial effects. 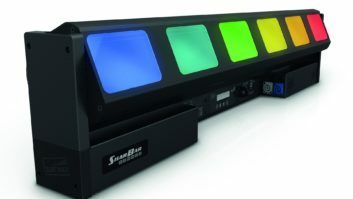 The Shar-Bar is an advanced moving LED bar with features that transform it into a brand new multi-beam effect light. It fits six 30W powerful new Osram Ostar RGBW LEDs. The optical unit coupled to each LED consists of a motorised system with double mirror, which means each light beam can be pointed independently of the others or locked within a 60° (+/-30°) cone. The Shar-Bar can therefore produce an effect similar to six separate lights working synchronously or asynchronously. Odeon is a series of pure architectural lights (IP66) available in two main versions, flood and linear, in a range of more than 30 models. They are available with 15°, 25°, 45° optics and RGBW, Tunable White and Total White configurations, and also may be further customised in terms of size and finish.